Feonic lead the field in high power, high sound quality resonance speaker technology. With a 15 year history supplying innovative audio solutions for home and commercial premises. Walls, floors, ceilings, hollow objects and glass surfaces can magically produce music, sound effects or speech. No boxes, no wires, no grilles. PDF technical documentation. Typical file size 300kb. All files are dated January 2015 unless otherwise stated. Attach to store windows and the sound generated will attract more shoppers to your store. Up to 40% increase in sales - what else do you need to know? Peel and Stick : Feonic Whispering Window® instantly turn windows into massive glass speakers. Live Events : MultiSensory Marketing, using theatrical effects in-window. Store windows turn heads when brought to life by sound. Popup Gigs : Transform the store window into a stage with a resonance speaker. Fans get really close to the performer without security compromise or expensive outside broadcast equipment. 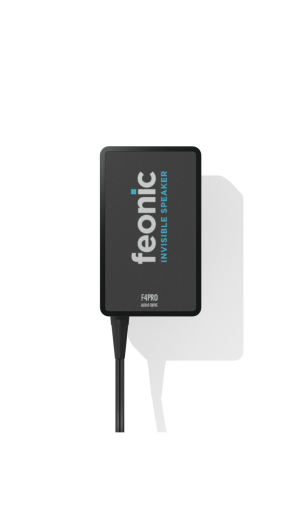 Primarily for Feonic resellers and distributors : enables powerful stereo demonstration of Feonic technology in a convenient portable manner when connected to a music player, PC, Mac or mobile phone. Promotional Campaigns : Independent research on the use of Whispering Window has shown consistent results: increased shopper engagement; increased footfall; and increased sales. Up to 40% sales boost in the first week of a campaign. Interactive Advertising : Attract attention to interactive advertising, augmented reality promotions and on line registration using interactive Whispering Windows. Portable resonance speaker. Stereo, dual drive F4PRO solution for office and boardroom presentations without the need for bulky PA speakers. Supplied with F110S amplifier, PSU, cables. Audio input from a standard headphone plug. Office and Boardroom Audio : Turn your boardroom table into a speaker. Install behind wood panelling or create invisible ceiling speakers. Applications include Whispering Window, spatial augmented reality, interactive advertising displays, point of sale, bus shelters, sound art installations, wet rooms, outdoor decking, public toilets, public spaces and more. Home Audio : Our Resonance Speakers are easily installed behind walls, floors and ceilings for great sound without design compromise. Painless installation without plastering and re-decorating. Applications include interactive advertising, kiosks, museum display cases, vending machines, portable sound systems, small rooms and demonstrators. Featuring the ultra light weight F110M (mono) and F110S (Stereo) amplifiers. Measuring only 65mm x 65mm x 28mm and weighing in at only 65 grams this range of amplifiers is perfect for smaller F4 installations. Perfect for museum display cases and similar where a very small amplifier and drive is required. 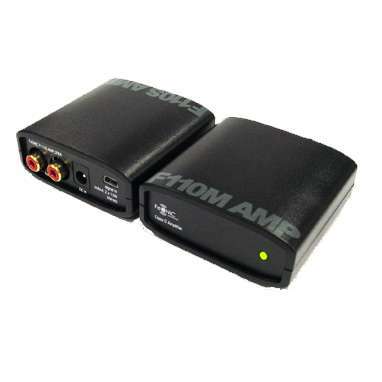 We can also supply more traditional amplifiers if required. 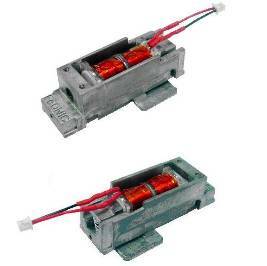 Also transformers for 100V PA distribution systems. 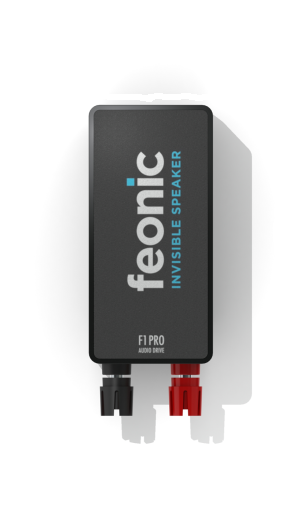 The F6.2 miniature audio transducer can be integrated into any small mobile or audio device to enable invisible audio to sound through a desk top or other resonant surface. Applications include mobile phone chargers and docks, Notebook PCs, Tablet computers, VOIP devices, Hands free equipment, Conference call systems. 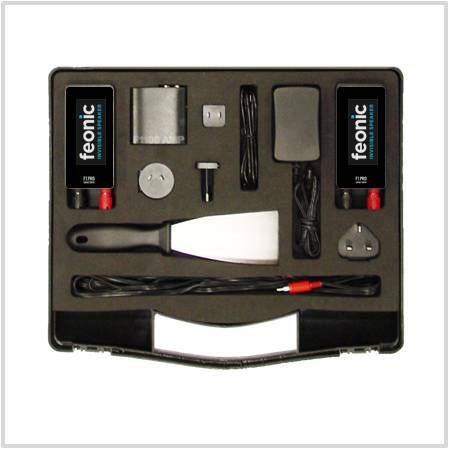 Hi Frequency Signal Transmission : Feonic resonance speakers can deliver signals of 22KHz and above enabling them to be used to transmit continuous sonic signals enabling detailed content delivery to your mobile device. Do you want to know how you can benefit from this amazing technology? Check out the case studies via the big blue buttons below. Convinced? Or need a bit of help deciding what you need? Then contact us. Need some more real world examples? For retailers, design agencies and audio enthusiasts. Click the appropriate button below.